Before you make any investment you need to understand what the potential returns are going to be. The heart of Step 1 is linking your business goals (revenue, profit, market share, growth, whatever) to changes in customer loyalty. That way you can demonstrate the benefits not just the costs of your customer loyalty program when you present them to your management. Start by taking your key business measurements and link them to changes in loyalty. If loyalty were to increase by 10% how much would profit rise? You can download our free return on customer retention tool to make this task easy. While customer satisfaction surveys are measuring satisfaction at finer and finer levels it is becoming clear that, as a metric, customer satisfaction is not a very reliable measure of loyalty. Customer satisfaction surveys were always intended to be customer loyalty surveys but they are in fact no such thing. Research is now showing that, depending on your industry, unless your customer scores you in the “top box” in your customer satisfaction surveys, i.e. 5 out of 5 they have little real loyalty to your organization. Let’s face it customer satisfaction is now table stakes -–you have to do better to keep them loyal. 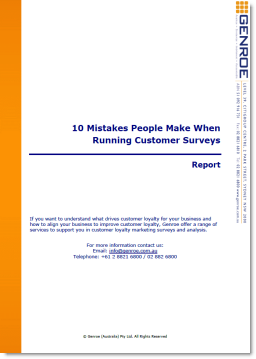 However, [research] has shown that there is one question, which is a good indicator of customer loyalty. That question is “How likely would you be to recommend us to a friend or colleague”. This approach is called Net Promoter Score® or NPS and has generated a lot of respect over the last few years. It’s simple, straight forward and easy for your customers to understand. But most importantly the answer is closely correlated to [customer loyalty and business revenue]. Every business has a range of attributes that might impact on loyalty. If you’re in financial services it could be areas like service fees, line lengths in branches, product features, etc. If your business is a physical product they might be delivery times, stock holdings, and order quantities. Starting with the one question above, add questions about these different potential drivers of customer loyalty to your customer loyalty marketing surveys. Don’t add too many. Maybe 10 or 15 and make sure that you use a rating scale to collect the customer perception of your performance. Now comes the most important part: find someone to do some statistical analysis on your results to determine which of the drivers are most significant in terms of customer loyalty. There are a few different techniques but correlation and regression analysis are the most common. Now you have the vital information that you need: you understand the state of customer loyalty and you understand which of your business attributes are most important to that loyalty. Start by focusing on just a few of the most important drivers that you also believe you can change and start making changes in your business. Perhaps you have found that line lengths in your branches are a key driver of customer loyalty. Work with your staff to identify ways to change your business processes and reduce line lengths. Make sure that you align staff compensation plans and bonuses so that the changes you make will be permanent. Once you’ve improved the most important areas move onto the next areas. Remember that the goal is to improve customer loyalty. Customer feedback surveys repeated at regular intervals will let you know how you’re customer loyalty programs are doing on both customer loyalty and the important drivers of customer loyalty that you have identified. To understand what drives customer loyalty for your business and how to align your business to improve customer loyalty, check out our Customer Feedback Survey Services.